Part of the Ginger Ray Vintage Affair range! 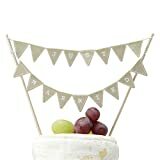 Give your wedding cake or cheese selection the love it deserves by adding this absolutely stunning “Just Married” mini bunting. This cake bunting comes complete with two sticks and each letter is printed in white. Each tiny triangular cotton bunting even has cute white stitching along the edge. Cake bunting measurements: H17cm W 17-24cm adjustable. This entry was posted in Wedding Store and tagged Affair, Bunting, Cake, Cheese, Ginger, Just, Married, Rustic, Vintage, Wedding by Formal Affair. Bookmark the permalink.